August. Latch. Igloohome. These are the names to remember, as they provide the best options for smart door locks when a homeowner has mortise-type doors. These older doors often require different kinds of locks, and until recently there weren’t any smart lock options that would work properly. As any homeowner knows, the best security system is the one that works for their house and meets their needs. Without a proper smart door lock, some homeowners were missing out. But now they don’t have to, because they can choose a smart lock that’s going to fit their door and give them the level of protection they’re looking for. That means peace of mind — and that’s really what a security system is all about. Without having that peace, there’s little point to paying for a security system and monitoring. A mortise-type door is an older door, and it fits the frame differently. Because of that, most of the smart locks in the past haven’t worked for these kinds of doors. Homeowners have just been out of luck, and have remained frustrated with companies that just weren’t meeting their needs in the best way possible. They’ve had to do without, but all that is changing. With today’s smart door locks that work with mortise-type doors, even homeowners that have older doors can get everything they need to feel safe and secure in their own homes. They can also quit worrying about losing their keys, which can further reduce their anxiety. Getting a smart door lock is a smart idea — and it’s one that most homeowners really can see the value of. It helps them secure their home in a better way than they were able to before, and reduces their risk of break-ins and related problems. That security and peace of mind can really be an important part of feeling good as a homeowner. 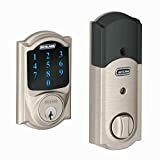 How Much do Smart Door Locks Cost? With the right security system, smart door locks are just part of the plan. But are they affordable? Yes, for the most part. The prices for them have come down as more companies make them, but those that fit mortise-type doors are still generally more expensive because they are newer and different from their more standard counterparts. Homeowners who are dedicated to having a smart lock with a mortise-style door can expect to pay around $300 to get the smart lock and the mortise kit. Prices vary, but that’s an average to low-end estimate for getting this type of lock. Many companies have packages that offer different things to homeowners. 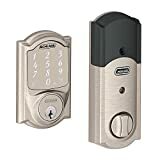 Getting one that offers a smart door lock for a mortise-style door may not be as easy as it would be with a standard door, but it’s still very important for any homeowner to get what works for them. Asking plenty of questions and taking a look at the equipment the security company offers can make it easier for a homeowner to make the right choice. Then they’ll have peace of mind, their home will be monitored, and they’ll have the type of smart lock they really want and need for their door.